It was in one of the 6,000 boxes they acquired from the EMI Music Canada archive. This record stamper for the Beatles' Rubber Soul was discovered by archivists at the U of C. Photograph by Victoria Lessard. Three archivists, a special mission and a project code name. While this may sound like a spy novel, it’s actually a story for the non-fiction section. In November 2014, Annie Murray, associate university librarian for archives and special collections at the University of Calgary, along with two other archivists travelled to Toronto to secure the acquisition of the EMI Music Canada archive – a whopping 6,000 boxes of material. The team had to call it “Project Milky Way” until the acquisition was officially announced in March, 2016. The plot twist came when Robb Gilbert, assistant archivist at special collections, opened up a box labelled “Business Affairs” and found among the materials a metal stamper of the Beatles’ 1965 album Rubber Soul. A stamper is a grooved disc that is pushed into warm wax at a record-pressing plant. 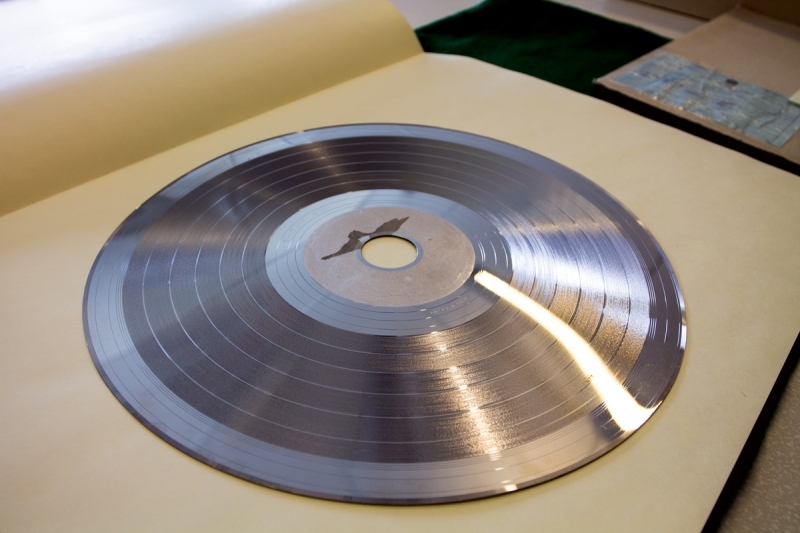 “It’s kind of like the mold that the records would be made from,” says Murray. The stamper was found in a folder dated “10.8.76.” Capitol Records-EMI of Canada officially opened a record-pressing plant in Ontario in 1977, though production began in 1976. Gilbert believes this particular stamper had some sort of significance; that it might have been used on one of the first pressings at the plant, or for some other event worth commemorating. There is currently only one other stamper in the entire EMI Music Canada archive; for Canadian group Edward Bear’s single “You, Me and Mexico.” Although, with Murray estimating they’ll be working on “receiving” the archive for at least another two years, who’s to say what additional treasures lie in wait for an intrepid archivist to uncover?